That said, when many of us saw mention of David Gilmour referenced in an iPad app, we paid our 99 cents and downloaded. The app, Metallic Spheres, is actually a universal app that is linked to his new project and not his guitar work of the past. It is the latest entry into a personal music generation that is based on a particular artist’s work where the result is not to create a song and record. Rather, the output is in real time as a ambient sounds linked to the app’s key items and your finger taps. There is a variety of screens that present the user with the logo of the project and background art. Tapping either the logo or the background art creates sounds that are from the project’s creations. Some are short unique pings to longer tones that create a mood when joined with other taps. 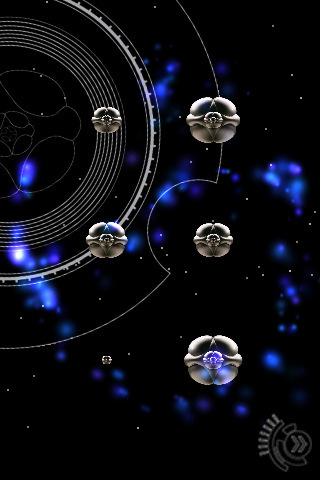 Some of the Metallic Spheres screens offer interactive changes based on the user’s taps. Streaks of light or flares and bursts. The visuals and the sounds, both from The Orb and David Gilmour result in a user experience that expands on what the project hopes to deliver. All through the iPad and controlled by the user. A bit hard to explain except to say that fans will spend many hours taping and moving about the app to enjoy the full depth of the offering. 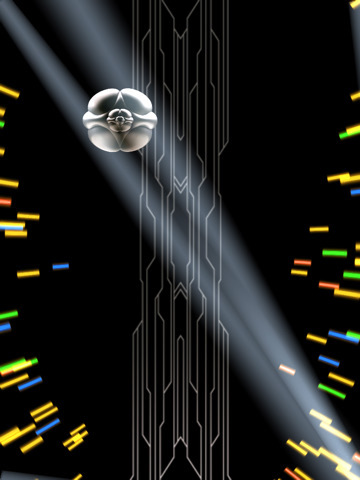 Metallic Spheres is put out by Sony Music. A quick look around presented us with many other creations around other artists with similar capabilities but using their look, feel and sound. For good or bad, one item we noticed was the lack of landscape view.